The rate of falls and the serious injuries and deaths from them has continued to increase over the last decade for elderly Americans. The rise in deaths from falls each year since 2007 has been dramatic. 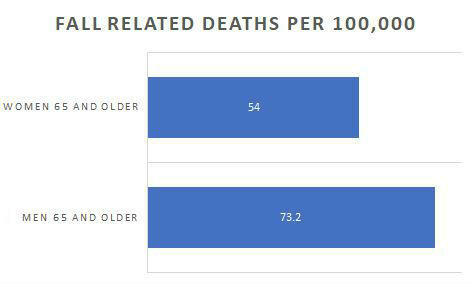 In the most recently available numbers from the CDC in 2016, fall-related deaths for people 85-and-older increased by more than 79%. While that group experienced the largest increase, the numbers are up across the board for elderly Americans age 65-and-older. Men, in particular, are at risk with 33.7% higher likelihood of dying from a fall. In truth, people of all ages can suffer from falls, older adults fall more often and have more severe consequences from those falls. Common fall risks are injuries such as head injuries or fractures to the shoulders, pelvis, hip, or spine. According to the CDC, falls are the most common form of injury, fatal or non-fatal, in adults aged 65 and older. The number of injuries and deaths makes sense when put in context with statistics from the American Academy of Orthopaedic Surgeons which shows more than one in four adults of this age suffering at least one fall each year. The costs are steep in terms of dollars and standard of living. Falls resulting in hip fractures drastically reduce a person’s lifespan, while falls lead many elderly people to move into assisted living. In 2015, U.S. healthcare costs from elderly Americans falling reached nearly $50 billion. One of the reasons falls are so dangerous is that many people don’t realize they’re at risk for falls until it’s too late. As you age it’s important to see your doctor regularly and ask if any of your current or past medical conditions increase your likelihood of falling so they can work with you to develop a fall prevention program. There are several key items to consider when it comes to assessing your risk of falling. Age. Whether we like it or not, the risk of falling increases with age. Most of the more specific items listed below are impacted by age, such as strength, reaction time, and acuteness of the senses. As we decline physically, we also reduce our activity leading to lower levels of strength, coordination, balance, and bone density – all of which contribute to a greater risk of falling. Medications. When you see your doctor be certain to have an up to date list of your most recent prescriptions, medications, and supplements. Your doctor can review the complete list and let you know if there are increased risks from their interaction, such as drowsiness from sedatives or complications from antidepressants. Health and lifestyle choices. If you have a history of ear disorders, for example, this can impact your balance and create a greater risk of falling. Talk to your doctor about any health issues you have related to your stamina, muscle strength, dizziness, pain, numbness or any other issues that occur when you stand up or walk. Also, if your clothing or footwear have caused issues with your mobility in the past, ask about options that may allow for better stability or less restricted movement. Lifestyle choices can also have a major impact on the likelihood of falling. Increased alcohol consumption can greatly increase the risk of falls as it impacts a person’s balance, coordination, reflexes, and decision making. Drinking can also impact bone strength, which is something that is also impacted by smoking. A poor diet can also have consequences as it can accelerate medical conditions and reduce energy. A history of falls. While this may seem obvious, if you have fallen before write down the details of your falls or near falls. Note where it occurred, what time of day, what you feel caused the fall. With more details your doctor can work with you to develop a fall prevention strategy. Negative experiences can condition people to an aversion from certain activities, and falling is no difference. This is certainly true for people as they age. After multiple falls, particularly after experiencing injuries, people may develop a crippling fear of falling that causes them to abandon physical activities. Of course, for patients who are already limited physically, abandoning physical activity can compound their problems making them weaker and accelerating their physical decline. If you find yourself shying away from physical activity to avoid falls, talk to your doctor to build a plan to rebuild your confidence and regain your prior levels of physical activity. As we age it’s important to begin thinking about fall prevention rather than dealing with the potentially devastating effects of even one fall. With that in mind, we’ve assembled a list of tactics that can be put in place to help you avoid your first, or further, dangerous falls. When our health begins to deteriorate, most of the major risks of falling will increase, which means maintaining health and fitness can be one of the most proactive ways to prevent falls. The following tips can help you maintain critical elements of your wellbeing that will reduce your likelihood of falls as you age. Consult your doctor on side effects of all of your medication, especially as you add new prescriptions. Keep a detailed list that you can provide with each visit. Maintain a healthy diet avoiding high fat, high sugar, processed foods while making sure to get recommended amounts of calcium. Work with your doctor or occupational therapist on an exercise program to stay active. Activities such as walking, climbing stairs, dancing, biking, and weight training can help maintain strength, flexibility, balance, maintain healthy blood pressure, and retain bone density. While our physical facilities decline, many of the issues that lead to a greater likelihood of falling can be eliminated or greatly reduced by making modifications to your home. The following modifications can substantially reduce the number and severity of falls in the home. Making lighting more accessible. Examples of this include easy to reach lamps next to the bed, swapping out traditional switches for glow in the dark switches, adding easier to access light switches near room entrances, and having readily available flashlights in each room in case of a power outage. Fall prevention for each room in your house. No room in a house is immune to falls, so it’s important to look at and address the most common causes of falls in each room and make modifications to make each room as fall-proof as possible. Hallways should be kept clear and provide easy access to light switches to connecting rooms. Stairways should be kept clear at all times and include sturdy handrails on each side. Slippery hardwood surfaces should have non-skid treads. Lighting and carpeting or flooring patterns should make it easy to see the edge of each step. Any loose carpeting or boards should be removed and replaced immediately. Bathrooms should be outfitted with slip-resistant rugs. In showers, loose soap and shampoo bottles should be replaced with installed dispensers that can’t fall and cause a tripping hazard. Adding grab bars near the toilet and in the shower will also make for safer access and exits. Glass doors should be replaced with nonshattering materials to reduce injuries during a fall. Modifications can also be made to allow for seated showering, like the installation of a seat and a detachable shower head. Bedrooms should have a lamp, flashlight, and phone easily within reach to allow for easy exits and calls for assistance. Beds should avoid having slippery sheets and at a height that allows for easy entrance and exits. Floors should be kept clutter free and nightlights can also be helpful for safe late night movement. Living rooms should be situated to allow for ease of movement. Make clear pathways and avoid tight spots caused by coffee tables, end tables, or other small furnishings. Avoid clutter and tripping hazards like power cables or extension cords. Kitchens should be designed for easy access to food, dishware, and utensils. Avoid putting items in hard to reach places that can cause a fall. Any spills should be cleaned immediately to avoid slippery or sticky spots that can prove hazardous. Any floor wax should be the non-skid variety, and throw rugs or other slipping or tripping hazards should be removed. One of the major issues that cause falls is the choice of inappropriate footwear. When choosing footwear, keep the following items in mind. Footwear of any type should be a correct fit. Shoes that are too tight or too loose can be a significant tripping hazard. Replace footwear if they have worn or loose tread – this goes for slippers or shoes. No matter how hard you try to prevent falls, they can still happen. In the case of a fall, it’s important to have a game plan beforehand so you give yourself the best chance for a quick recovery. First of all, don’t panic. Do a quick self-evaluation to determine if you’ve been hurt, and if so, what’s been injured. If you are able to get up, move yourself along the floor to a chair or railing so you can more easily get yourself to a seated position. If you’re unable to get up, call for help to anyone nearby. If there’s no one near, get to a telephone and call an emergency contact or 911. For more information on falling statistics and fall prevention use the links below.